Here is a Sponge Bob cake made from a rectangular cake pan. Bake your favorite cake mix and let cool. 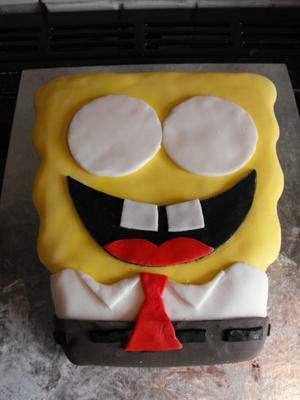 Fondant was used to create Sponge Bob. Tip! Make sure to make this cake ahead of time. 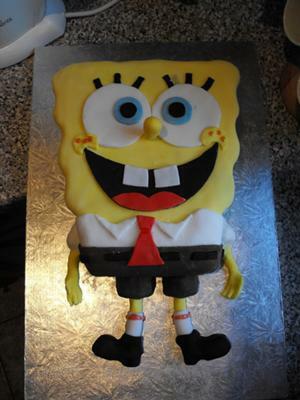 To begin planning this cake, a picture of Spongebob was printed from the internet. This cake was made starting with a rectangular shaped cake. It was cut into a "wiggly shaped wedge" and then carefully cut in half. 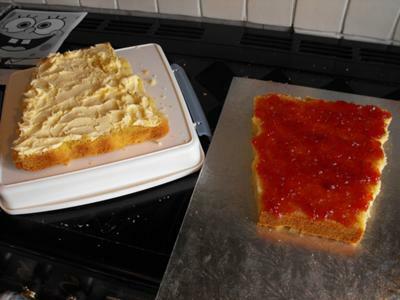 Buttercream icing was spread on one half, and strawberry jam on the other. The halves were put together and the first layer of yellow fondant was placed over the entire cake. The shirt, eyes and mouth were added next. Tongue, trousers and tie were then added. A few more details such as the eyes and the eyelashes and now you can definitely see Spongebob emerging! The nose was added and a few finishing details such as the arms and legs! Extra fondant was laid above and below Spongebob to insert the birthday candles. What a perfect birthday cake for a Spongebob themed party. 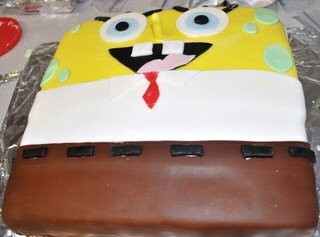 While planning our Spongebob page, I came across pictures of this cake. I contacted the owner of the photos and we were given permission to use them on our site. We really appreciate it!